The Complete Collection of The Secret Life of Trystan Scott serials in one omnibus edition. I think the best fictional work in literature is being written in the YA genre. This is a perfect example. The story is captivating if not realistic. The main characters are very likable and have a sweet storyline. This is obviously not a steamy romance novel and I thought it was really nice to have a female character who wanted to save her virginity for her husband and the male character to not only support her, but is also inexperienced rather than jaded. I am well past YA in years but I will continue to delve into this genre. Well done Ms. Ward. I thought this was a pretty good YA story. It had a lot of interesting elements and good characters. I feel like the book tries to send a positive message to teenagers by giving life advice so that was cool. However, I actually found it to be quite juvenile...and this is coming from someone who likes a good YA novel. Now even with that being said, I think this is a pretty decent read for someone 21 & under. I would recommend it then. This story was so predictable I knew the next scene well in advance. Narrators did an excellent job with what they had to work with. Good it was a bundle or wouldn't have finished! It was slow, and I'm glad it was only 1 credit for all 5 books or I would have never continued the series! 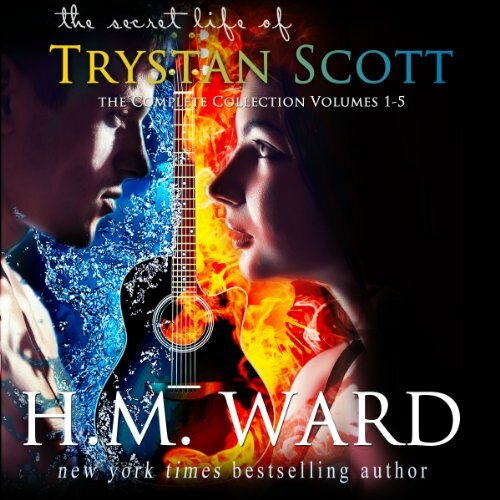 Where does The Secret Life of Trystan Scott rank among all the audiobooks you’ve listened to so far? It's not what I usually listen too. But it was a great story. It keep my attention. What about Jennifer O'Donnell and Sebastian Fields ’s performance did you like? loved both of their voices would definitely listen to a book they do again. A very unlikely story geared at encouraging childish misperceptions of growing up. The acting was okay but the story line with both predictable and immature. Has The Secret Life of Trystan Scott turned you off from other books in this genre? Would you be willing to try another one of Jennifer O'Donnell and Sebastian Fields ’s performances? If you could play editor, what scene or scenes would you have cut from The Secret Life of Trystan Scott? What made the experience of listening to The Secret Life of Trystan Scott the most enjoyable? Since the way of the book is written in the two perspectives of the main characters I constantly forgot that thinking things and saying them is and can be a massive step and sometimes people possibly needing two filters before their brain and mouth to say something even remotely nice seem like a great thing that or things just take time.